Frank Sumares, pianist, composer, arranger, educator, and longtime SJW family member, passed away on March 28, at the age of 73. 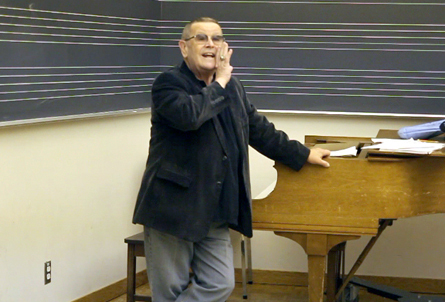 To give you a sense of how deeply Frank touched his students, colleagues, and band mates, and how much his influence has impacted their lives, we’d like to offer a selection of anecdotes and memories from SJW students and faculty. I remember walking nervously into an evaluation room to play for Frank on my first day at the Stanford Jazz Workshop as a 13-year-old. I already knew who he was from seeing him perform in the Bay Area. Though I hadn’t yet learned all my major scales, I wanted to show him that I knew what a diminished scale, was because it was so “advanced.” I was afraid I’d mess up, but Frank was all jokes and smiles, and I soon forgot where I was and just played. He was a crucial source of encouragement throughout my education, giving me the advice and confidence I needed to play music for fun. Even when I returned years later to teach and perform at the SJW as an adult, Frank was full of helpful advice and warmth. I still use his handouts. I’ll miss you Frank. May your music live on in all of us. I first met Frank at about age 15 when I took his jazz theory class. That’s where I learned his adage, “Up your thirds, down your sevenths!” I also remember him greeting me with “ii-V-I, momma, get down!” Over the years at the Stanford Jazz Workshop or at San Jose State, I’d greet him as my Hayward home-boy. We saw each other over the years at SJW: I remember kvetching at lunch, hanging in his “office” in the lobby of Campbell. He’d always help my piano players who were having trouble. Last summer, we taught a class together on the last day of camp, talking to kids about continuing their musical experience beyond camp. I said, “You don’t need a whole band to play, you only need two!” So we played duo for the kids. We were having so much fun, laughing, playing stuff back and forth, that we made our point to the students. Good for them, but I was just so happy that I got to play with Frank! 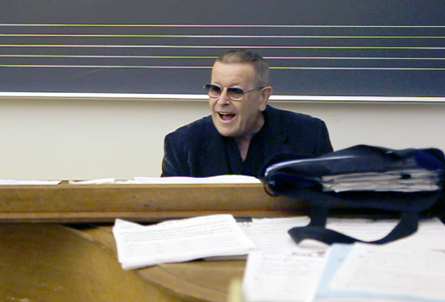 Frank was always there for students, willing to assist even the most beginning student the basics of jazz theory and harmony. My son, Ryan, had attended as a trumpeter and was required to take theory and harmony, something he of course had no clue about. In the course of the week, Ryan learned quite a lot from Frank, and every time our paths would cross Frank wold inquire about Ryan and how he was doing. Frank was a caring person who loved to share his knowledge of this music. In addition, he was one of the funniest guys around, alway making me and everyone else laugh! 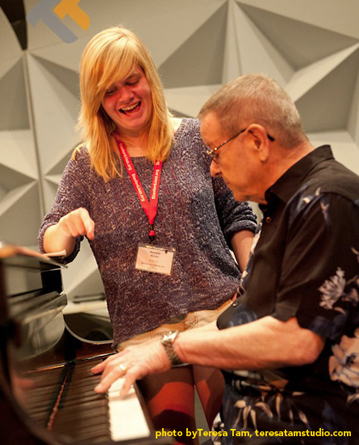 Frank will be missed for sure, but he leaves a legacy of what music education is about, and what it should be. First, when I was in high school (in Carmichael, CA), I was playing in the jazz band and had no idea what to with all of those funny chord symbols and slashes on my music. My band director gave me a copy of Frank’s book on jazz piano voicings. It was the first I had ever heard of “comping,” and he opened up a whole new world of harmony to me. Thank you Frank! Second, when I was a young jazz band director at American River College, Frank would frequently clinic my band at various festivals. His supportive, friendly, yet direct demeanor in front of me and my students was a big influence on my teaching and on my understanding of how to direct the band and communicate with students. Again, thank you so much Frank! Third, as a fellow instructor at SJW, Frank was always around and available, always supportive an complimentary of what we were doing. He always had great stories about the music and a life in education. I always looked forward to talking with Frank and getting just a few more nuggets from him. I will sincerely miss Frank and his sly smile, and his exquisite mentoring. I will miss you sir! I will miss Frank tremendously at Jazz Camp. He was a pal, ever ready with his unstoppable sense of humor, and extremely generous with his musical knowledge and talent. Frank was very encouraging and helpful to me as teacher. I’ll always think of him with a smile in my heart. I was a student of Frank’s at Chabot College. I was terrible and a guitar player, and he specifically told me that he did not care for guitar players. But I didn’t care because he made me laugh everyday. Years after, I was on a late night BART train, with hardly anyone around. I sat down and after a minute or so, someone grabbed my neck from behind and said, “Give me your wallet!” I jumped up and turned — and there was Frank, laughing! That was the last time I saw him. He was really the most honest and best teacher i ever had.